Arugula is a dark green, peppery leaf that works equally well in salads or as a cooked green. It's available year-round but is at its best when the weather is mild since warmer weather makes it bolt and turn bitter. Look for dark greens leaves of a uniform color. Avoid yellowing leaves, damaged leaves, wilted leaves, or excessively moist-looking leaves. A bit of dirt is fine - it is likely the result of recent rain or watering (splashing dirt up onto the leaves). Arugula is sold either by the bunch or as loose leaves (much like spinach). In general, bunched arugula has larger leaves and loose-leaf arugula has smaller leaves. Bunched arugula needs to have its tough stems removed and discarded before cleaning. Gently swish the leaves in the cool water, letting any dirt fall to the bottom of the bowl. Lift clean leaves out of the water and transfer to a salad spinner or several layers of paper towels or a clean kitchen towel. Dry in the spinner or by rolling in the towels. Transfer leaves to a layer or two of paper towels (or clean, dry ones if you dried the leaves with towels), gently roll them up, and store in a loosely closed plastic bag in the fridge. Arugula stored ​correctly will last up to a week. Uncleaned leaves keep about 3 days. Smaller arugula leaves tend to be milder, while larger leaves tend to have a more aggressive, peppery kick. They are great in salads on their own or combined with other lettuces. Wild arugula - sometimes available from foragers in the late spring and again in the fall in temperate regions - is much more peppery than most cultivated leaves. It's perfect for using as a garnish since just a few leaves give plenty of kick. It's also great other raw preparations where its intense flavor can be appreciated. 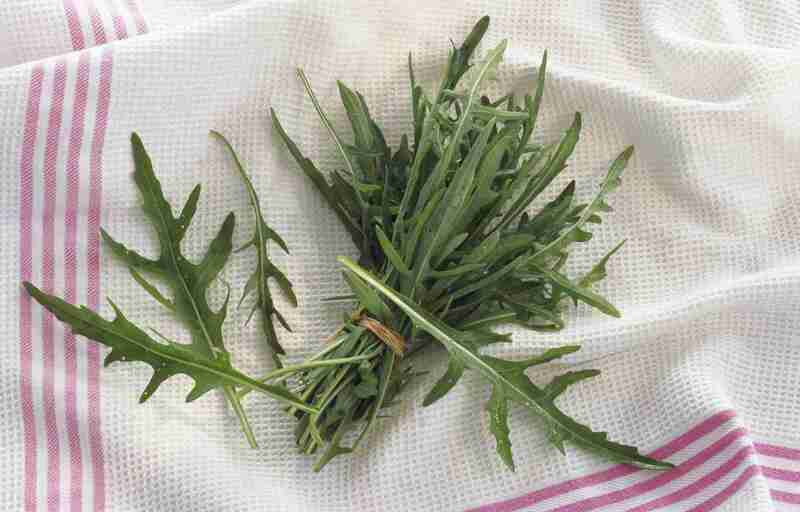 Larger arugula leaves tend to have a stronger flavor, so they can be cooked successfully without losing all their flavor or used raw by those who like its assertive flavor. Arugula also works lightly cooked. Use it as you would spinach - in quickly sautéed and tossed with pasta, tossed into stir-frys, or added to soups - cooking it quickly. Be warned that it has a stronger flavor and tougher, more fibrous texture than spinach. Small or wild arugula leaves – with their bright, peppery kick but relatively tender texture – make pretty and delicious garnishes. A small handful on top of a plate of pasta or wilting gently into a bowl of soup adds flavor, texture, and color to a dish.